K. GANAPATHY M.Ch. (Neurosurgery), FACS, FICS, FAMS Ph.D is a Past President of the Telemedicine Society of India; Former Secretary and Past President of the Neurological Society of India; Former Secretary of the Asian Australasian Society of Neurological Surgery; Past President of the Indian Society of Stereotactic & Functional Neurosurgery; An Adjunct Professor, at the IIT Madras, Tamilnadu Medical University & Anna University, Chennai. Dr. Ganapathy was formerly Honorary Consultant and Advisor in Neurosurgery Armed Forces Medical Services. In 1990 he became the first in South Asia to get a Ph.D in neuro-imaging. A former examiner & Inspector for the National Board of Examinations Ministry of Health, Govt. of India, he was also an overseas examiner to the Universiti Sains Malaysia and the Royal College of Surgeons Edinburgh. He is Member of the Editorial Board of 4 International and 3 National Journals in Neurosciences and was the first neurosurgeon from South Asia to be formally trained in Stereotactic radiosurgery in 1995 and later in robotic radiosurgery in 2008. 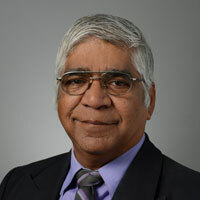 He is a reviewer for ATA’s official journal and other telemedicine journals. A pioneer in introducing Telemedicine in India, Dr. Ganapathy has been working relentlessly from 1999, for the growth and development of Telemedicine in India. He was a Member of the National Task Force on Telemedicine. Extensively travelled, he is a popular speaker in national and international conferences. He started the first formal Certificate course on Telehealth Technology, in conjunction with the Anna University. He was a mentor for MBA scholars from Harvard Business School and for the Ross Business School University of Michigan, the Yale University and from several globally renowned Indian universities. For the last 5 years 90 senior managers from 32 different countries doing an executive MBA at the London School of Economics visit his dept as part of an educational tour. During the last 40 years he has presented more than 400 papers in national conferences and 150 in International meetings. He has published about 205 scientific papers & 16 chapters in books, besides about 70 articles in “The Hindu” a widely read English newspaper.